FREMONT, CALIFORNIA, UNITED STATES, July 9, 2018 /EINPresswire.com/ -- Lockdowel Inc. announces their all new approach to simple, fast chair assembly - the Lockdowel Slide-to-Lock Chair fastener system. This is a unique Lockdowel product design incorporating standard Lockdowel EClips fasteners in a standard wood chair. No glue, tools, screws or cam locks are required to assemble the chair, and a chair designed using Lockdowel fasteners can be assembled in about one minute. The same chair utilizing conventional screws and bolts requires at least six minutes to assemble. The new chair will be available to view at Lockdowel Booth 8073 at theInternational Woodworking Fair (IWF) 2018, August 22-24 in Atlanta. According to industry experts, chairs make up 40% of the U.S. furniture market.Traditional chairs use 8-12 bolts, screws and glue that often come apart over time, but the Lockdowel chair uses slide-to-lock EClips fastening without bolts, screws or glue. 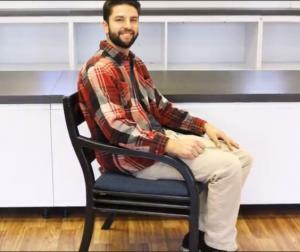 “Chairs can now be shipped flat-pack for simple, fast assembly on site. And the chairs never come apart with vibration or wear,” Koelling says. See how the new Lockdowel Slide-to Lock Chairs are assembled in these videos.